Can you offer money when the order is for weapons? Cast: Anish Jethmalani (Abdullah Khan), Raymond Fox (Simon Craig), Demetrios Troy (Colonel Afrid), Timothy Edward Kane (Jmes Warnock)Craig Spidle (Senator Jefferson Birch), Behzad Dabu (Saeed), Terry Hamilton (Dmitri Gromov). Probing topical current issues is one of the Timeline Theatre’s missions. Blood and Gifts suits their purposes well. It is a terrific theater piece, full of mystery and high drama. 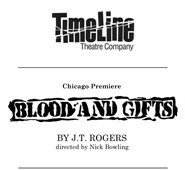 Nick Bowling and the Timeline group offer not just a well-conceived and brilliantly acted version of J.T. Rogers play, but also a closeup version. The action is compressed on stage, because Timeline is tiny. 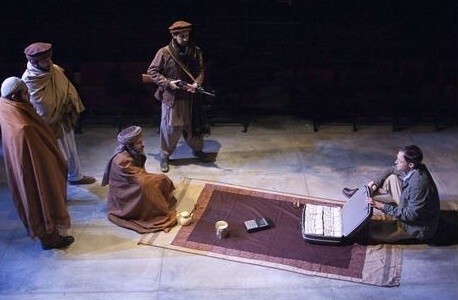 The company has mounted several other plays with large casts and multiple scene locations. On first blush this might seem like a poor idea. In fact, David tackles Goliath in complex ways. In The Front Page and Enron, the intense emotion of the drama is heightened by the venue's compacting and compressing. For an audience often cheek by jowl with the performers this is both an intense and intimate experience. It is deeply satisfying. Music plays an important role, both in setting the tone and as one of the 'gifts.' Habibullah Wardak and Mikhail Fiksel are credited with the evocative native music. Duran Duran tops the request list of Saeed. If the US wants information, it doesn't have to dance to the music, but it has to provide the locals with pop. J.T.Rogers researches his projects in depth. We were invited to explore the set during intermission. Offices of the International Security in Pakistan had war maps posted and detailed histories of Islam. Real declassified documents are filed in a CIA officer’s cabinet and spread on his desk. Although the play is principally in English, many languages are spoken. You always understand what is being said, because the language of spies and the agents they select to do their bidding in foreign countries is universal, in gesture, body movement and tone. Lies are particularly convincing in the mouths of talented agents and their selected local allies. The game, whose world shifted markedly at the end of the Cold War, is depicted in continuous action from 1981 to the present. Anguish surrounding families and the breeding of sons were particularly poignant. It is here that the spies find common and moving ground. Their wish for domestic life is often trumped by what seems like an odd sense of duty. CIA agent James Warnock, played by Timothy Edward Kane in a flat but fascinating take, is newly married but needs to vindicate his exodus from Iran. He left contacts and friends behind to suffer torture and murder when the US exited that country. His guilt is more real than Ben Allfeck's cheerful take off. Simon Craig plays a Brit who helps you understand why the sun set on the British Empire. He prefers being away from home, it turns out fortunately, because he ends up not having a choice. Terry Hamilton plays a disheveled Dmitri Gromov, a Russian master of his mission. He cannot manage his teenage tart long distance. 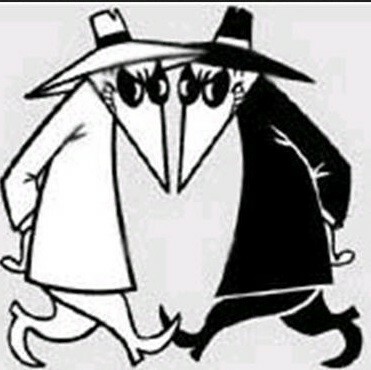 Like opposing lawyers in litigation these spies have more in common with each other than outsiders of the same nationality. Demetrios Troy was compelling as the Pakistani Colonel, particularly when he explains to the English agent, who is Jewish, that Pakistan and Israel have a lot in common: They are surrounded by enemies and under constant threat. His barely contained fury escalates as far as it can without brimming over. As Abdullah Khan, who will end up running the show in Afghanistan, Anish Jethmalami fights to avenge family murders committed by his fellow warlords. Jethmalami ranges from a seductive politician to an infuriated national. Rogers has shaped his scenes and characters well. Problems with our presence in countries we do not and perhaps cannot understand are poignantly portrayed. The ribald humor of Charlie Wilson’s War is turned dark and raunchy here. This is an engrossing and elucidating evening at Timeline. Next season, Timeline will produce Raisin in the Sun, The Normal Heart, the Chicago premier of Juno by Joseph Stein with music and lyrics by Marc Blitzstein. To Master the Art returns to the Broadway Playhouse at Water Tower Place.